This exploration is for all ages of kids as the smilies below show. You can color the map of Columbus’s first voyage. Then make the Columbus hat and spyglass craft with your little ones. This exploration adds to the fun activities in Layers of Learning Unit 2-20, which is about early European explorers including Christopher Columbus. Paper crafts and historical maps are frequent elements of the Layers of Learning curriculum. Christopher Columbus’s voyage to the New World was a hugely pivotal event in world history. It linked the western and eastern hemispheres and made contact with widely different civilizations. Columbus had a dream for years about crossing the ocean but needed money, men, and ships and that meant backing from royalty. Learn about his struggle to make his dream come true and the first voyage across the uncharted ocean. Start off your exploration on Columbus with a trip to your library. Just below we recommend a few books by age group, but if you can’t find these, search for Christopher Columbus and pick from your library’s selection. Starts with the childhood of Columbus and through his struggles to get his dream expedition across the uncharted ocean funded. From a great children’s author. This is a fictionalized account of Columbus’s voyage as told from the point of view of a cabin boy aboard his ship, the Santa Maria. This is a translation of Columbus’s actual log book in Columbus’s own words. After you have done some reading about Columbus color a map of Columbus’s First Voyage. You might want to also trace the route around a globe. While you color the map have a discussion about what the world was like before Columbus crossed the Atlantic and then what happened after his voyage. Your younger kids will enjoy making a paper craft Columbus hat they can wear and play with while they learn about Columbus. On the front of the hat is the Jerusalem cross, because Columbus was a devout Christian and believed to his dying day that when he discovered America he did it at the behest of God. Print onto card stock, color, then cut apart the pieces. The two long rectangles at the bottom should be glued or taped together then trimmed to go around your child’s head. On the back of the hat are the words “In 1492 Columbus Sailed the Ocean Blue.” It’s a pivotal date; one of the most important in world history. Your kids should remember it. 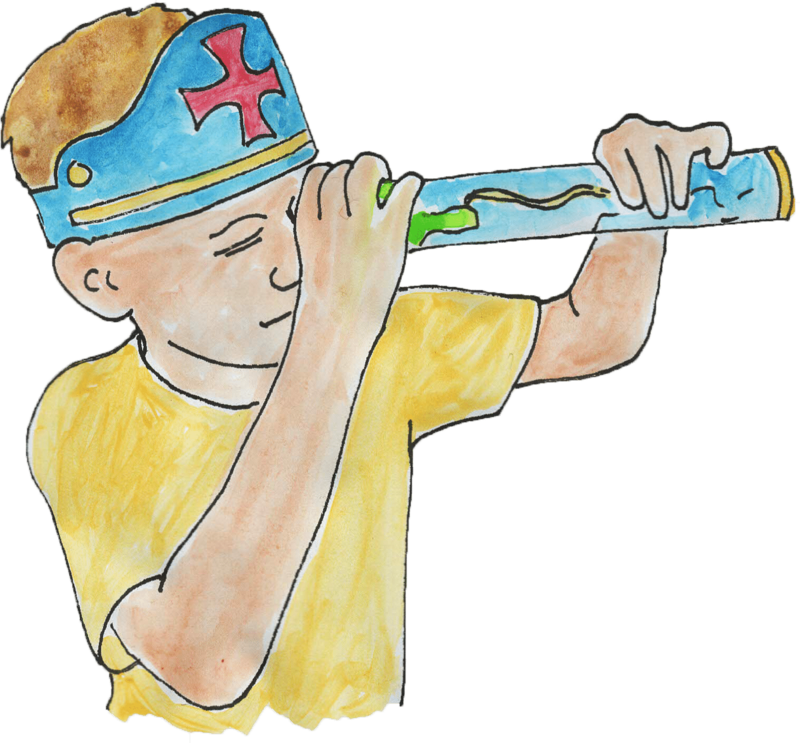 Then make a spyglass with the map of Columbus’s first voyage printed on it. Just color the map then roll the paper into a tube. Glue it around a paper towel tube to make it durable. After reading and coloring the map or making the hat and spyglass craft do a writing project to show what you have learned. For Columbus, write a few of your own log entries as through you are the captain. Write about the day you first sighted land. How do you feel after the uncertainty of the voyage? What do you hope this voyage will do for you? Additional Layers are extra activities you can do or tangents you can take off on. Additional Layers are sidebars in the Layers of Learning curriculum. They are optional so just do the ones that interest you. Columbus was wildly successful. He discovered a whole new world, made Spain fabulously rich, and profoundly changed the course of history. Usually when we see someone who is successful we say they’re “so lucky” or words to that effect. But what Columbus did had nothing to do with luck. As you learn more about his life leading up to that first voyage make a list of everything he did to make his dream come true. Then think about how you can apply that to your own life. In 14 hundred and 92 Columbus sailed the ocean blue. The date of Columbus’s voyage was one of the most important in world history. Your kids should know it so when they come across other people and events they can place them before or after Columbus. The people Columbus first met in the New World were the Taino Indians. Learn about them and their fate.